Overview: Culture is the way people live. Culture affects everything we think and do, from how we treat our elders, to who we allow to be a healer, to what we do when our children do not feel well. Culture shapes our health as much as our genes do. The way we define ourselves culturally (by ethnicity, religious belief, politics, sexual orientation, disability, age and more) affects what we will do for their health. 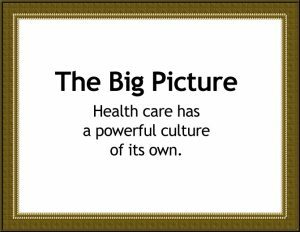 A good health care provider recognizes this and tries to learn about the many cultures of his or her patients. While no summary of a culture can possibly describe the variation that exists among individual members of a cultural group, it is a good idea to learn more about the general health beliefs and experiences of a given group. What exactly is meant by “culture?” Doesn’t everyone belong to a lot of cultures? How do I talk to a patient about his or her culture? Q. What exactly is meant by “culture?” Doesn’t everyone belong to a lot of cultures? A. There are many, many definitions of “culture”, but one of them is “the beliefs and values shared by two or more individuals that shape their behavior”. And yes, everyone belongs to a variety of different (and sometimes even seemingly opposing) cultures. A patient may belong to the culture of motorcycle riders, the culture of cigar smokers and the culture of rose growers. Each of these cultural identities will shape that person’s health through his beliefs, values and behaviors. Q. What is cultural competence? A. Cultural competence in health care is evident when people of all cultures are treated in a way that affirms their worth and preserves their dignity. Cultural competence is important in every aspect of our public lives, but it is a crucial skill for health care providers, who deal daily with diverse people in life and death situations. Cultural competency is not just awareness or sensitivity to different cultures. A culturally competent provider knows about different cultural perspectives and has the skills to use that knowledge effectively in cross-cultural situations. Q. How do I talk to a patient about his or her culture? A. Because every patient is an individual with a unique personal history, belief system, and communication style, what you think you know about someone may not be true. Until you know that the cigar-smoking, motorcycling patient you are seeing for shortness of breath also regularly sprays his roses with pesticide, you may not know enough about his culturally-based behavior to treat him effectively. Ethnomed contains information about cultural beliefs, medical issues and other related issues pertinent to the health care of recent immigrants to Seattle or the US, many of whom are refugees fleeing war-torn parts of the world. Culture Care Connection: This Stratis Health site is an online learning and resource center aimed at supporting health care providers, staff, and administrators in their ongoing efforts to provide culturally-competent care in Minnesota. CHW Services are Reimburseable: The Department of Human Services can facilitate reimbursement for Community Health Worker (CHW) services. 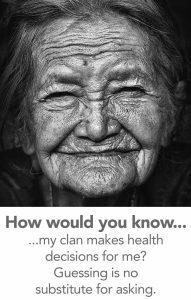 CHWs are members of minority ethnic, racial or cultural groups, who serve as liaisons between their fellow community members and the health system. This publication from DHS explains the details. Deaf and Hard of Hearing People Have Their Own Culture: A review of the culture of deafness, provided by the Minnesota Department of Human Services. Covers terminology, ASL, deaf-blind culture, and more. Mshale offers news for MSP African community Mshale is a community newspaper based in Minneapolis for African immigrants. Contains original news stories, newslinks to other websites, blogs, entertainment features, and ads. A good way to keep up on news affecting African patients.